Thessaloniki is the Capital City of Northern Greece and one of the most ancient cities of Europe with more than 2,300 years of existence. It is strategically positioned in the centre of the Balkan Peninsula connecting Europe with Asia Minor; thus making this City one of the most important commercial and financial destinations in Eastern Europe. 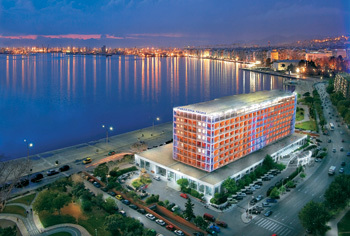 The hotel is ideally located by the sea, on the main city avenue and offers breathtaking views of the City’s historical White Tower and Thermaikos Gulf. Inspired by the sparkle of the Ancient Greek Kingdom of Macedonia, the Classical Makedonia Palace, superbly renovated, revives hospitality in a grand fashion, while the constant swirl of guests adds to the hotel’s cosmopolitan flair. The hotel’s 283 guestrooms and suites beckon with luxury. All guestrooms feature luxurious exquisite designer fabrics in warm sunset or metallic hues, down comforters and pillows, full air- conditioning, direct dial telephone with voice mail, free use of wireless high speed internet access, satellite and Pay TV, in-house video, radio, CD player, tape recorder, mini bar, electronic safe boxes, marble bathrooms with telephone extension, hairdryer, dual voltage plug, working desk and spectacular views of the White Tower and Thermaikos Gulf. 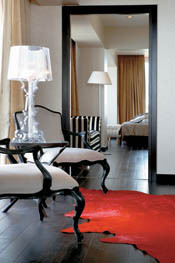 The presidential suite “Filippos II” is the only suite in Greece with a private cinema! Classical Madedonia Palace offers a variety of fine dining and restaurant options: enjoy your night at the “5 The Restaurant” with exquisitely prepared menus for refined tastes and sumptuous gastronomy; for modern Mediterranean tastes dine at the “Yacht & Salons Restaurant” while watching the ships sailing by the Thermaicos Gulf, finally the rooftop “9 Cloud Level” is the ideal location for fusion cuisine or a cocktail with dance music and romantic sunsets. After diving in one of the two outdoor swimming pools, guests can relax over refreshments at the “2 Square Water” pool bar. Located in the Lobby area, the all day lounge bar serves an excellent variety of hot beverages, snacks and sweets. The hotel’s wide range of facilities and services include a fitness area, 24-hour concierge service, multi-lingual staff, gift shops, free Wi-Fi, express laundry/dry cleaning service, baby sitting (upon request), car rental and private parking. The Classical Madedonia Palace hotel offers stylish and sophisticated conference facilities, featuring state-of-the-art and flexible event and meeting space, including elegant halls accommodating banquets and cocktails up to 600 attendants. Experienced conference and banqueting professionals are at hand to provide efficient services for any type of event, from presentations to celebrations!